Discussion in 'Forza Horizon 4' started by GTPNewsWire, Feb 4, 2019. This article was published by Kyle Patrick (@SlipZtrEm) on February 4th, 2019 in the Forza Horizon 4 category. Can't wait to the drive the Griffith and Fairlady Z.
AgentBlackDog, 53Nicolas, Nielsen and 1 other person like this. I love the addition of these cars! The offroad Quartz Regalia looks absolutely INSANE! SecretAgentZero, EngieDiesel, CDailey and 6 others like this. So awesome that TVR is getting some love. Both the Griffith and Tuscan will be a lot of fun to drive! The Z32 and Eldo making their first appearance in Horizon is also great, and many others as well. Seeing the Regalia making a come back (in both versions) is brilliant! Things are getting good!! SVPSkins, 53Nicolas, L8 Apex and 1 other person like this. SVPSkins, AgentBlackDog, L8 Apex and 1 other person like this. SecretAgentZero, KayX23, AgentBlackDog and 1 other person like this. Actually, the Z32 was in Horizon 2. AgentBlackDog, Apple Slipper and TokoTurismo like this. I believe the '59 Eldorado was in Forza Motorsport 4. Nevermind. It actually says that in the article. I was wondering why the Prelude wasn't in the game the other day. The Prelude in Forza doesn't have custom parts. This might be good or bad depending on what you like best. The biggest cars are the new Griffith, Eldorado and perhaps the Z432. The Tuscan should be a pretty good car in its class but we have the Sagaris, it doesn't impress. I'm hoping they add the '96 model with the Mugen kit next. Why was the Cadillac Escalade not mentioned in the article? Anyway, great stuff coming here. The Regalia is the only one I don't understand, but each to his own I guess. Can we be sure the 2018 TVR will match the final performance and appearance of the real car? To this date the car has still not reached any customers. Because the Yanks hogged all the time for FM7. You could clearly see the guy from PG sat on the left was not happy at all, nor would i if i'd flown all that way only to be given 10mins. I can't wait to drive the TVR! What part of my post were you replying to? Because I cannot connect the dots. I’d say so. If it’s close enough to the final product for T10/PG to get a laser scan or CAD model of it (i.e. the physical dimensions are finalised), the specs probably are too. The fact that they work with manufacturers before a car is released, like with the Ford GT, probably means they have access to final specs. If that Regalia Type D isn't an Extreme Offroader, I'll be very sad. Plz don't make me cry Playground kthx. They'll explain more about the Series 6 Update next week when PG does their stream. Apple Slipper and RazorSharkz like this. DJTHEKING, Apple Slipper and 53Nicolas like this. Nope, the Fairlady Z432 (the first-gen Z with the 2.0L Hakosuka GT-R engine) is coming in addition to the Z32 generation Fairlady Z.
I know what the Z432 is, this is just the first I’m hearing about it. Could have sworn it was already in the game as well. Edit: and yup, I was right. It’s been in the game. Sooooo yeah, one too many numbers there. VXR, ykiki, ClydeYellow and 3 others like this. On of my favourite A-class cars to drive. The wide-body kit on it looks awesome too. I love cars that have their mirrors mounted on the actual front quarter panels like that. Not too keen on the new TVR but the older one is ace and the Final Fantasy car is pretty cool, too. Looking forward to the Z32 as well. All I really want is a 1996 Impala SS. And for the Crown Vic to show up in a wheelspin/auction house for me, lol. Not good enough. I demand you find me a Crown Vic on the auction house as penance for your sin. UKMikey, ykiki, ImaRobot and 3 others like this. 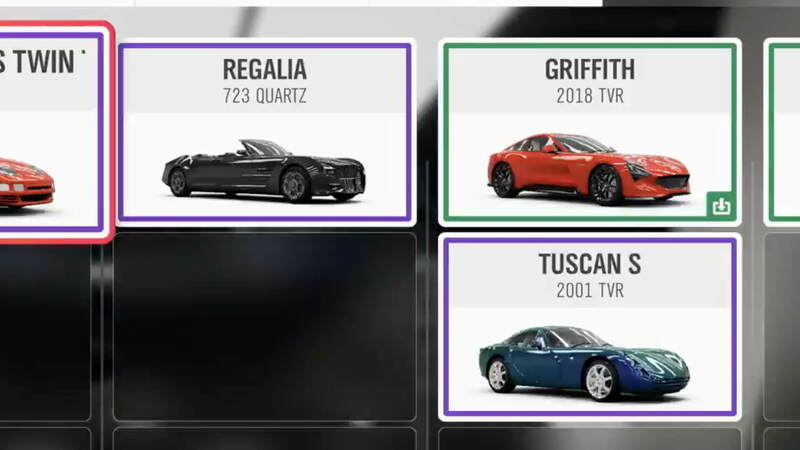 I was thinking: the Griffith that was in the pre-release leaks is finally coming to Forza, and it will be accompaigned by another mental machine, the Tuscan. That'd seem to set the theme of that week as "British machinery straight from the loony bin"... And what other vehicle that fits that bill to an airplane-engine-powered T was leaked together with the Griffith? And they are also adding a vintage racing helmet and suit? That's right, you heard it first here guys: the long-awaited Napier-Railton suicide machine is coming to Forza within the next three weeks. Or maybe not, it seems I'm wrong in my predictions far more often than I'm right. Apple Slipper, Populuxe Cowboy and HyperSpeeder like this.